His reputation grew in the United States following the critical reception of his design for the Finnish Pavilion at the 1939 New York World's Fair, described by Frank Lloyd Wright as a "work of genius." In his analysis of Aalto, art historian Sigfried Giedion gave primacy to qualities that depart from direct functionality, such as mood, atmosphere, intensity of life and even 'national characteristics', declaring that "Finland is with Aalto wherever he goes." Alvar Aalto was born on February 3, 1898 in Kuortane, Finland, the eldest of three children in a middle-class family. His father was a surveyor. In 1903, the Aalto family moved to Jyväskylä. Today, the town is famous for housing about 70 buildings by Alvar Aalto, despite his having lived there for only 24 years. He studied architecture at the Helsinki University of Technology from 1916 to 1921, then returned to Jyväskylä, where he opened his first architectural office in 1923. The following year he married architect Aino Marsio. Their honeymoon journey to Italy sealed an intellectual bond with the culture of the Mediterranean region that was to remain important to Aalto for the rest of his life. Aalto moved his office to Turku in 1927, and started collaborating with architect Erik Bryggman. The office moved again in 1933, to Helsinki. The Aaltos designed and built a joint house-office (1935-36) for themselves in Munkkiniemi, Helsinki, but later (1954-55) had a purpose-built office built in the same neighborhood. Aino Aalto died in 1949, and in 1952 Alvar married architect Elissa Mäkiniemi who lived until 1994. In 1957 they designed and had built a summer cottage, the so-called Experimental House, for themselves in Muuratsalo, where they spent their summers. 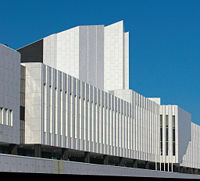 Alvar Aalto died in May 11, 1976, in Helsinki. 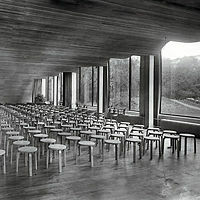 Although he is sometimes regarded as the first and the most influential architect of Nordic modernism, a closer examination of the historical facts reveals that Aalto (while a pioneer in Finland) closely followed and had personal contacts with other pioneers in Sweden, in particular Gunnar Asplund and Sven Markelius. What they, and many others of that generation in the Nordic countries, had in common was that they started off with a classical education and were first designing in the so-called Nordic Classicism style before moving, in the late 1920s, towards Modernism. In Aalto's case this is epitomized by the Viipuri Library (1927-35), which went through a transformation from an originally classical competition entry proposal to the completed high-modernist building. His humanistic approach is in full evidence there: the interior displays natural materials, warm colors, and undulating lines. The Viipuri Library project lasted eight years, and during that same time he also designed the Turun Sanomat Building (1929-30) and Paimio Sanatorium (1929-33): thus the Turun Sanomat Building first heralded Aalto's move towards modernism, and this was then carried forward both in the Paimio Sanatorium and in the on-going design for the library. Though the Turun Sanomat Building and Paimio Sanatorium are comparatively pure modernist works, even they carried the seeds of his questioning of such an approach, and a move to a more daring, synthetic attitude. Aalto was a member of the Congres Internationaux d'Architecture Moderne; attending the second congress in Frankfurt in 1929, and the fourth congress in Athens in 1933. It was not until the completion of the Paimio Sanatorium (1929) and Viipuri Library (1935) that he first achieved world attention in architecture. His reputation grew in the United States following the critical reception of his design for the Finnish Pavilion at the 1939 New York World's Fair, described by Frank Lloyd Wright as a "work of genius." It could be said that Aalto's reputation was sealed with his inclusion in the second edition of Sigfried Giedion's influential book on Modernist architecture, Space, Time and Architecture. The growth of a new tradition (1949), in which Aalto received more attention than any other Modernist architect, including Le Corbusier. In his analysis of Aalto, Giedion gave primacy to qualities that depart from direct functionality, such as mood, atmosphere, intensity of life and even 'national characteristics', declaring that "Finland is with Aalto wherever he goes." Aalto's awards included the Royal Gold Medal for Architecture from the Royal Institute of British Architects (1957) and the Gold Medal from the American Institute of Architects (1963). Helsinki Univ. of Tech. Auditorium. The Aalto-Theater opera house in Essen, Germany. Aalto's wide field of activity ranged from the design of furniture and glassware to architecture and painting. His vase designs are world-famous. In 1932, he invented a new form of laminated bent-plywood furniture. Aalto furniture is manufactured by Artek, a company Aalto co-founded. Aalto glassware (by Aino as well as Alvar) is manufactured by Iittala. Aalto's career spans the changes in style from pre-modernism (Nordic Classicism) to purist International Style Modernism to a more synthetic and idiosyncratic approach. 1927–1935: Viipuri Library|Municipal library, Viipuri, Finland (Winter War|now Vyborg, Russia), new drawings, 1928, 1929, 1933, built according to last drawings 1934 – 1935. 1957: The Experimental House, Muuratsalo, Finland. The Savoy Vase, also known as the Aalto Vase. 1932: Paimio Chair ARMCHAIR 41 "PAIMIO", artek. Retrieved June 18, 2007. 1933: Three-legged stacking Stool 60 STOOL 60, artek. Retrieved June 18, 2007. 1933: Four-legged Stool E60 STOOL E60, artek. Retrieved June 18, 2007. 1935-6: Armchair 404 (a/k/a/ Zebra Tank Chair) ARMCHAIR 400, artek. Retrieved June 18, 2007. 1939: Armchair 406 ARMCHAIR 406, artek. Retrieved June 18, 2007. 1954: Floor lamp A805 FLOOR LAMP A805, artek. Retrieved June 18, 2007. 1959: Floor lamp A810 FLOOR LAMP A810, artek. Retrieved June 18, 2007. "We should work for simple, good, undecorated things" and he continues, "but things which are in harmony with the human being and organically suited to the little man in the street." - speech in London 1957. 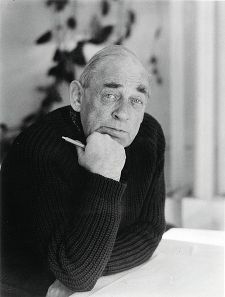 Alvar Aalto is the eponym of the Alvar Aalto Medal, now considered one of world architecture’s most prestigious awards. Aalto was featured in the 50 mk bill in the last series of the Finnish mark (before the Euro). 1998 marked the centenary anniversary of Aalto's birth. The occasion was marked in Finland not only by several books and exhibitions but also by the promotion of specially-bottled red and white Aalto Wine, and a specially-designed cupcake. ↑ "Aalto, Alvar. Retrieved June 18, 2007." Encyclopædia Britannica. 17 Dec. 2006. Pallasmaa, Juhani (Ed.) Alvar Aalto Furniture, Helsinki: Museum of Finnish Architecture. 1984. Jormakka, Kari; Gargus, Jacqueline; Graf, Douglas The Use and Abuse of Paper. Essays on Alvar Aalto. Datutop 20, Tampere 1999. The extensive archives of Alvar Aalto, Jyväskylä, Finland. Alvar Aalto Museum Retrieved June 18, 2007. Material is available from the former offices of Aalto, at Tiilimäki 20, Helsinki, headquarters of the Alvar Aalto Foundation. Retrieved June 18, 2007. The Alvar Aalto Museum and Aalto Academy publish a journal (twice a year), ptah which is devoted not only to Aalto scholarship but also to architecture generally as well as theory, design and art. Retrieved June 18, 2007. One of the most extensive collections of references on Alvar Aalto in the U.S. can be found at the University of Oregon. For a brief chronological list of the life and works of Aalto, as well as a bibliography, see the publication Alvar Aalto Arkkitehti / Architect 1898-1976, Helsinki: Rakennustieto / Alvar Aalto Säätiö, 1999. Non-Finnish speakers tend to make a big issue of the fact that Aalto is the Finnish word for 'wave' –as if he was predestined to design the sort of architecture he did. However, Aalto is a rather common surname in Finland. Though Aalto is one of the most written about modern architects, research is made more difficult for non-Finns because nearly all primary material is in Finnish. Thus most non-Finnish research tends to look for points of interest outside Finland or beyond the historical facts. Such writings also tend to rely heavily on secondary sources, on those few works written by Finns translated into English. artek Aalto furniture; company founded by Aalto. This page was last modified on 14 March 2019, at 15:40.